An innovative e-commerce platform that integrates 3D scanning technology, through an iPhone app. 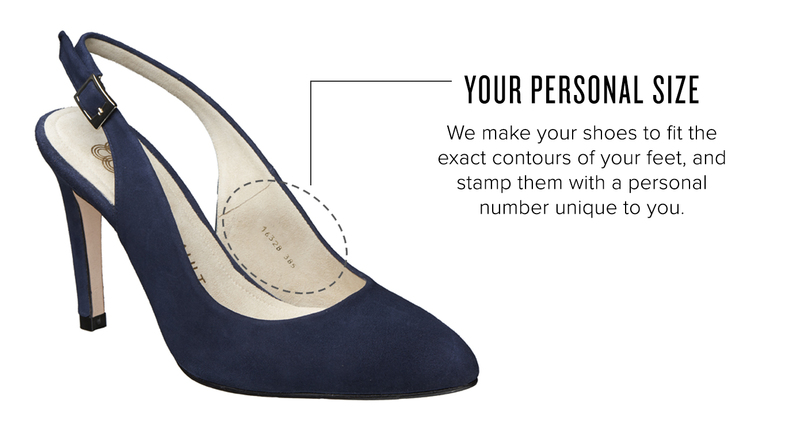 Gorgeous, bespoke shoes that fit to the exact measurements of your feet. There are no traditional sizes, shoes are 100% custom-fit to you. Manufactured by hand in Alicante, Spain. Proven business model. Thousands of women have scanned, with 30% repeat customers. Opportunity to disrupt the footwear industry and e-commerce landscape, with the ability to expand into men's shoes, licensing, and white labelling. Experienced Board of Advisors, including Nina Garcia (Editor-in-Chief ELLE Magazine, Project Runway judge). If you are not 100% happy we will remake your shoes until you are thrilled. Our smart, innovative technology and proven business model puts us ahead of competitors. We’re disrupting the $65 Billion footwear industry in the U.S. with the opportunity to expand into other markets. Significant traction with thousands of women scanning and buying, with over 30% repeat customers. Ability to scale globally with our smartphone app and platform. Opportunity to branch into product extensions (e.g. men's shoes), licensing and white labelling. 1 of 8 companies selected for Google’s Accelerated Growth Program in Q1-Q2 2017 (which helped launch Warby Parker and Casper). CEO & Founder, Sandra Gault has a background in imaging technology at IBM & Kodak and two successful startups behind her. The team at True Gault is comprised of seasoned business leaders and advisors. True Gault is redefining the way women buy shoes. Traditional shoes are one-size-fits-all, but our feet do not conform to this standard. Research shows 95% of people’s left and right feet are not the same size. 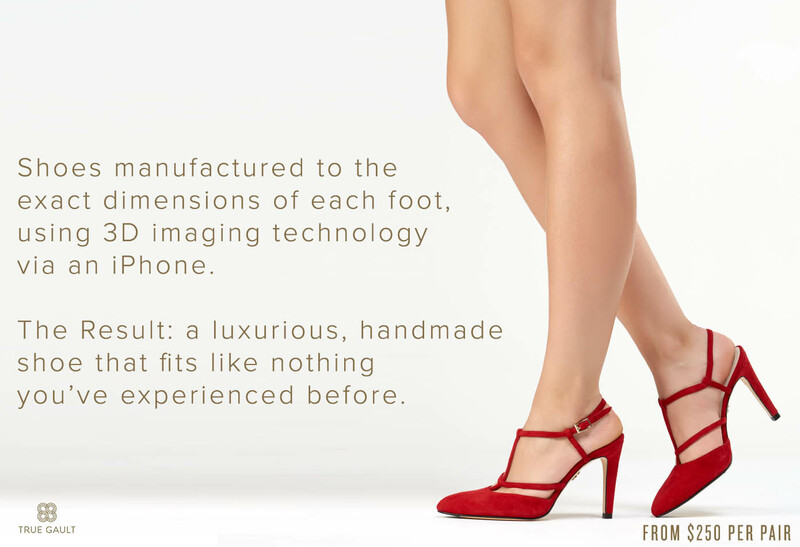 True Gault embraces this complexity, offering customers an innovative shopping experience and custom shoes fit each unique foot. We have created our own proprietary fit-formula through 3D scanning to capture individual measurements - all via a smartphone. Using the app, the customer takes three pictures of each foot and a 3D model is generated. Traditional sizing is now irrelevant as the customer has their own unique size. 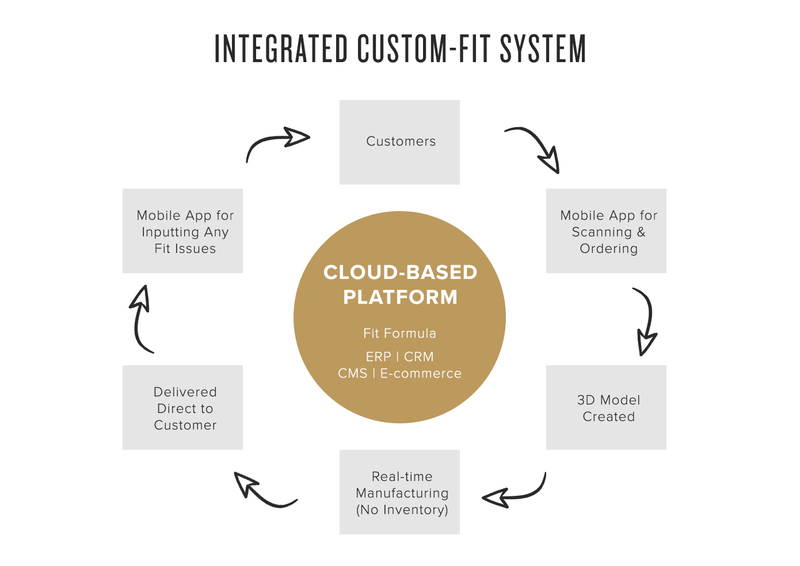 Our backend system handles the order fulfillment, processing, and customer-fit-feedback. This direct-to-consumer experience keeps costs low which we pass on to the consumer via lower-priced, luxury shoes. With thousands of women’s feet scanned, the app is already aggregating valuable, predictive data and becoming smarter with each usage. The more people who scan, the more refined our algorithm gets, the more accurate the fit, and the happier our customers are. Our shoes are an affordable luxury (priced between $250-$350) and positioned to appeal to a broad demographic. We guarantee an exceptional, unparalleled fit, with unmatched comfort, and style, delivered to your door in under 4 weeks. We have built a business model around the desire for custom-fitting shoes and have only just scratched the surface of this hyper-growth opportunity. Our next phase will be to increase brand awareness, expand globally, offer an Android version and launch new styles. The idea emerged as Sandra stood in painful designer heels at a party, realizing that no amount of compliments could make her feel at ease. It was then she vowed that every woman, regardless of age, size, or shape of her feet, deserved a beautiful pair of heels that she could wear all day long, in comfort and confidence. So she channeled her three passions, fashion, business and technology into True Gault. 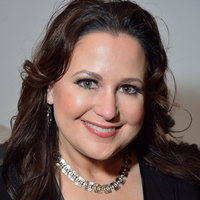 Sandra has over 20 years of experience in building business, leveraging technologies, and leading teams. Her experience at Kodak and IBM Corporation refined her skills in imaging technology to achieve her vision of customizing high-fashion shoes of the highest quality. She never sets foot anywhere without a pair of her true-fit shoes. To date she has taken over 5,626,290 steps (walked 1,674 miles), in her True Gault shoes. * Shoe are valued at maximum of $350 per pair. Each investor will be given a 50% discount code (for $500 investment) or a code for number of shoes they are awarded (for $1000 or higher investment). Discount codes will be issued within 12 weeks after crowd funding campaign ends and expire 1 year from date of issuance. Investor can select any shoe from the True Gault collection. ** Includes above perk detail terms. Lifetime discount is assigned to one user and cannot be shared nor combined with other discounts. *** Includes above perk detail terms. A 30-minute style consultation from True Gault designer or shoeologist can be held in New York City or done remotely. Does not cover travel to New York City or accommodations. **** Includes above perk details terms, except for the 30-minute style consultation. Dinner valued at $500 total. Does not cover travel to New York City or accommodations. ***** Includes above perk detail terms. True Gault reserves the right to determine the final naming of the shoe. ****** Includes above perk detail terms. Travel value limited to $5,000 total. The smallest investment amount that True Gault is accepting. True Gault needs to reach their minimum funding goal before the deadline. If they don’t, all investments will be refunded. If a trigger event for True Gault occurs, the discount provision gives investors equity shares (or equal value in cash) at a reduced price. True Gault needs to raise $25K before the deadline. The maximum amount True Gault is willing to raise is $1.07M. A personal thank you from the Founder, Sandra Gault and a shout-out on social media. Does it work on Android? Do you plan to launch an Android version? There is no current Android app. The company is working towards an Android version. What is the price of a pair of shoes? Why don't customers choose a shoe size? Traditional shoe sizing is not used as 3D scanning technology determines the measurements of both the left and right foot. Shoes are handmade from these individual measurements. In the event shoes don’t fit, the customer has 30 days to contact customer support. A new pair of shoes will be made at no cost. How will the crowdfunding money be used? Sandra Gault: Yes and you know how hard it is sometimes walking in high heel shoes. 90% of all women wearing shoes are ill-fitted and in the US alone, it’s a $65 billion shoe industry. 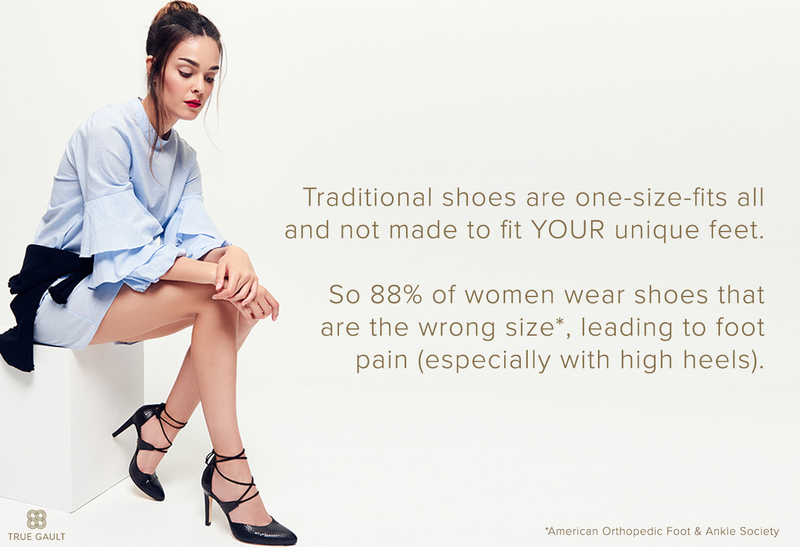 49% of those are women shoes and 90% of all women wearing high heel shoes are wearing the wrong size. We scanned over 2000 women so far and nearly 95% of all those women have different left size and right size feet. This causes a problem. They always have to sacrifice style, comfort for fit. With True Gault, the customer no longer has to do that. We just scan their feet. In fact we don’t even do shoe size, it’s their unique size. Each shoe gets its own serial number and once you scan your feet once with the iPhone, you don’t have to do it again. You just reorder your shoes over and over again. We have 20 different styles and 10 different leathers. We’re currently raising $2.5million to actually help us grow customer acquisition, some out with new models and go and market the product. Not only in the North America, but around the world. We currently run on an iPhone and we want to use that money to also create an android version of the product. We love our product and more importantly we love our customers. We were talking about earlier about how important it is to talk to customers and really focus on solving a true problem. We are solving an amazing problem with a technology that’s never been delivered in the shoe industry for high heels. Our factory is in Spain and we hand make them in Spain, we deliver them in under four weeks. We built the entire infrastructure so that now we have an actually on-demand direct consumer customized platform that can be used in the future for other products and licensing opportunities but today, we’re actually going to bring these product to the market and as I’ve mentioned, we already have 700 customers with over 1000 pairs of shoes and a 35% repeat rate. Is that good? Tim: Terrific. Yeah, that’s great. Why don’t you come, pull up a chair, have a seat and we’ll ask you some questions. Bill: I didn’t understand how the iPhone, the cell phone has anything to do with the shoe. Sandra Gault: You would think that why would you use a cell phone right? We’re actually geeks in high heels and what we did was we took photogrammetry technology, technology 3D imaging technology and out it in the iPhone. All the consumer has to do is take an eight and a half by 11 inch piece of paper from their printer and they put it on a hard floor and they take their naked foot and they put one foot on the piece of paper and we take three photographs. It's like taking a selfie of your foot on the outside, on the top and on the inside. Then our smart technology behind the scenes actually creates a 3D Image of that specific foot and they do it on their right foot. We do it through the app. It's self-explanatory or they can even have a friend scan themselves. Tim: Now you guys do it or I can do it for myself. Here I can take off my shoe, here we’ll do this. Sandra Gault: You want to scan your feet? Tim: Here is a piece of paper. Sandra Gault: You need a blank piece of paper with nothing on it. Tim: Here’s my blank piece of paper. Sorry about the smell everyone. My foot almost fits on the paper. Jess: Oh my gosh. It’s the least glamorous feet of all time. Sandra Gault: We actually do it this way. Sandra Gault: We hold it this way and we put your foot ... just backslide. Tim: We’re just like you are not looking at dad’s foot. Sandra Gault: Roll your pants up and you lift your pants. Tim: Then I got my camera and then I just take a shot? Sandra Gault: You actually download our app. You download our app first. Our app actually walks you through the process of actually scanning your foot. Tim: Oh, are you going to do it? Sandra Gault: I can do it. Tim: Yeah, let's do it. Jess: I am embarrassed that we're showing your foot. Sandra Gault: We actually need to do it on a hardwood floor. Bill: I want to see you walking in high heels. Tim: Does it take a while to do or should we just ... you want to do it right now? Sandra Gault: We need to do it a hardwood floor and a different ... and a nice piece of paper. Jess: Do it right there. Tim: What's wrong with this piece of paper? Sandra Gault: Because it needs to be one piece of paper not a stapled piece of paper. [inaudible 00:12:13] can you go get a piece of paper? Tim: There we go. This will work. Jess: We got it, okay. Sandra Gault: It has to be no paper, no printing. We’ll get you a piece. All right and we need to do it on the hardwood floor. Do we want to move over there and do it? Bill: Roll up the rug. Sandra Gault: Let’s just do one foot and then you’ll get an idea of it. Tim: Wait, there is a piece of paper with a little bit of a staple in. It still has to be perfect? Sandra Gault: We want it nice and flat and crisp. Here is why. I have a background in digital imaging. I worked at I.B.M. and Kodak and at Kodak, we did printers. Tim: You worked at Kodak. Tim: Were you there when it collapsed? Sandra Gault: No. I left further before. Tim: Oh boy. Good. I’m glad you weren’t there at the time. Sandra Gault: I was there on the digital side so I knew nothing about traditional film. I was on the camera and ink-jet printing. Bill: You learned a lot. Jess: She's led a great team. Tim: Yes if you’ve operated a business before that would be great. Sandra Gault: I did. When I was at Kodak they were promoting women. They said, “Hey we want you to do this ink-jet printing paper.” I said okay. They said it's only six million in revenue and eight million in negative earnings so it's not making any money. When I left the business four and a half years later, it was a $65 million business with $20 million in profit and now it's over $300 million for Kodak. Bill: How much do you want my check for? Jess: I have a couple of questions. You make these shoes. Jess: Do you make one style of shoe with the similar height or how many different types of shoes do you make? Sandra Gault: First of all we make ... all of our patterns are done digitally. We adjust it to the feet. We currently have 20 styles and most of the styles come in either two inch or four inch and each style you can apply up to 20 different leathers. I can get this shoe for example in a beautiful black pattern or I could get it in a bright red suede. It's my choice. Jess: How long does it take to get a shoe to my doorstep, because I assume you are not manufacturing in the US. Are you? Sandra Gault: No. We're manufacturing in Spain in Alicante, Spain, which is the epicenter of the best quality of high heeled shoes. When you place your order through the iPhone, we quote four weeks but we usually deliver under three. Jess: Then how are you going to be the best? He got on this topic but the best in this industry? There are a million shoes. I see a new shoe company every week, every other week but in this realm, how are you going to stand out above the noise? Do you have a media partner, do you have an interesting new unique e-com strategy, because I think you need something really well thought out as far as a roll-out strategy. Jess: No, let's talk about the marketing side. Let’s talk about ... I want people who are going to buy these. Sandra Gault: We know our customers right down to the zip code level. Out of the 3300 area codes or counties in the U.S, our target market which is 30 to 55 women, who have four year degrees, they're making 4100,000 or more, they're C.E.O. 's of their households, they usually have kids and they're only in 110 counties in the U.S. The way we go after it is we have been nominated in part of the Google accelerator growth program. Google is actually helping us get off the ground with our ad campaigns. We're also doing a lot of social media and we're doing affiliate and content marketing, but on top of that we have found that this is extremely repeatable. About35% of our own customers, repeat 35% of the time. They also refer 21% of the time. We are going to actually have customers helping us sell this product. Tim: Has anybody bought one? Bought a pair of shoes yet? Jess: Yes. She said 700. Tim: 700 people, what does that add up to for revenue for you? Bill: That’s how many shoes? Sandra Gault: It's about a thousand pairs of shoes. Joti Benson: The last question I have is, do the buyers find the shoes really comfortable? Joti Benson: How comfortable is it? The claim ... your science claim is that these shoes are much more comfortable because you can custom make for their size and the women who are buying it, they are vouching for it? Joti Benson: by the way I love the name True Gault. Bill: Gault is your name, right? Sandra Gault: Yes, it's my last name. Jess: I love the name. Sandra Gault: It's true to you and true grit. That has a nice feel to it. It also is unisex because this technology we can make men shoes. Joti Benson: Your primary ... the science that you are going to explain to someone is that because left and right feet are different size you’re going to make shoes based on what the feet size are? Joti Benson: Can you make it, take it to the next level which is based on the height of the heel and maybe even the strength of the heel, everything you can get. Sandra Gault: Yes. We also do material science so it's also material science. We not only do the bio-mechanics of the foot, but we think about the material science, the padding, the cut of the material, the shape of your foot, the style that you bought. How do we actually get out there? When women wear our shoes, many of them don't go back to other brands. They'll come back and re-buy and they love the product. We also will start doing things like bringing in industry experts to the industry, into the business. I'm really proud to say and I think I can say it on camera but Nina Garcia is joining our company. Bill: If I talk to nine, ten people, how many of those ten that were wearing high heels, would say they are uncomfortable? Sandra Gault: About 90% of them. Bill: That's what I thought you would say. Tim: I like the way you said [inaudible 00:20:15]. Jess: We've all been waiting patiently because it smells lovely. Sandra Gault: He actually has good looking feet. Bill: We're going to have to go before we suit him up. Thank you. Sandra Gault: I will make him a pair of high heels shoes. Sandra Gault: No you got to just do the ... we need the piece of paper. Tim: Where is the paper? Speaker 6: Come on now. You can come out with the paper. Jess: Perfect. Let’s put it on the wood. Tim: Put it on the wood and then I'll go over there. Sandra Gault: Just have him sit down. Sandra Gault: We’re going to start with your right foot. You have your left foot. Let's start with your right foot. Tim: The right foot’s not nearly as attractive. Sandra Gault: We're going to just ... and we're going to just push your foot back. Bill: If you think the left, what is it? [crosstalk 00:21:11]. Sandra Gault: You download our app. You download our ... are we ready? Hang on. Let me just get this going here. Tim: My yoga teacher would say that I have not stretched my toes enough. Speaker 7: Can you pause? Can you pause or one second and let him get over your … Can you actually scoot a little bit to your right? Just a little bit. Sandra Gault: You download our app. Jess: Just take it off [inaudible 00:21:56]. Speaker 6: That’s what I said but he can’t. I don’t know why. It’s okay. He’ll get it from here. Speaker 7: Yeah, I got a good angle here. Tim: There is the foot. Sandra Gault: Now, you download our app, register, you put your piece of paper that you pulled out of the printer on a hard floor like this and then you just line up the guide and when it turns green, boom, just take a picture. Then we move over and we take the top. We make it green. See how the guide turns green. You could do this yourself. Tim: You’ll have to reach way over. Sandra Gault: Or you can have a friend do it. Tim: It’s like a selfie stick without it. Tim: I am having a friend do it. Sandra Gault: Yes. If you could just move your left foot out of the way and then you just take your picture and then you’re done. Tim: We can do one foot. One foot is perfect. Tim: I'm done and now I'm going to have a high heel. Sandra Gault: We’ll make a pair of high heeled shoes to fit your feet. Tim: You only have one foot left. Sandra Gault: We would do the other foot. Do you want to do the other foot? Sandra Gault: I didn’t know if you wanted to do the other foot. We can do the other foot. Tim: I think we're good. Tim: Yeah. I think we're good. Speaker 6: Actually what I think ... I think it would be funny if we could do the other foot and then later we see you got high heels. Tim: Okay. Let’s do the other foot. Sandra Gault: All right. Let’s do that. Sounds good. Tim: let me redo that then. Then let's do the other foot. Sandra Gault: Now we're going to do the other foot. Sandra Gault: That’s I'm right handed and I decided to do that. Bill: I’m glad she’s not selling underwear. Sandra Gault: Really? Custom under ware. Tim: Anybody have a toe nail clippers? Sandra Gault: We'll give you a free pedicure if you buy a pair of shoes. How does that sound? I think you need one. Bill: You don’t think so. Jess: 100% he needs one. Jess: I really hope the cameras are just far enough away. Tim: Looks the nails of a puma. Sandra Gault: Now what we do is we do two. I’m going to do the right again because it's new technology, so we’re going to just do it one more time because we want to get your actual measurements in. Joti Benson: Your nails are going to crash her app. Jess: Joti, what do you think about those ... Yeah, what do you think about his feet? Tim: How would this app do on app dynamics? Do you think this app will do well? Joti Benson: I think your nails are going to crash and that’s ... we have to help her fix that. Tim: I'm pretty sure this is the largest foot they’ve had on the ... how many have you sold? Sandra Gault: We have sold over a thousand pairs. Tim: 600? Oh a thousand pairs. Sandra Gault: We have 700 customers and if you could just move your left foot out of the way. Yes we have done two transgenders. Jess: That would be plus size shoes probably. Sandra Gault: Yeah that would be a male as a female. Tim: Now we do the left foot again. Sandra Gault: Yes. I just have to take three more pictures. Tim: Usually this is about when the app crashes. Most demos crash about right here. Sandra Gault: Hopefully not. I don't think so. Joti Benson: She’s doing great so far then. Sandra Gault: Can you move your right foot out of the way? Bill: All blew up. It turned into flame. Sandra Gault: Yeah, we're good. Go on in. Tim: I’ll give you a credit card and we’ll buy a pair of high heels. You know how that goes. Here you can have your ... Unless you want that sit. Jess: I love it, okay. Good. I can't wait to see his high heels. I feel like I should try some on but we can do that in a minute. Tim: Let's do that another time. Tim: Why would you want these? Jess: Yeah, right. I don't know, I don't know. I’m so happy that we just went through that for your feet. Sandra Gault: That’s going to be my story about demoing. You had the $100 bill on the copier, I’ve got your son being photographed on T.V..
Bill: Those are going to be very famous feet. Sandra Gault: Yes, they will be beautiful. Bill: Someday they’re going to be beautiful but right now they're very famous. Tim: You’re raising $2.5 million, what's the evaluation? Sandra Gault: The valuation right now is $8.5 million. Bill: $8.5 and have you raised $2.5 already? Bill: You have the system going. Sandra Gault: -to push, yeah. It starts going then. Tim: Who put the $2million in? Sandra Gault: Our lead investor is Cayuga Venture Fund and they're out of Ithaca. They’re associated with Cornell University and Joanne Wilson. Sandra Gault: Yeah and several actually, the rest of ours are angel investors and guess who they are. They are customers. Bill: That’s a good crowd fund. [crosstalk 00:27:22]. Let’s ask the crowd. Jess: What do you think? True Gault. Thumbs up, thumbs down or do you want to fund her? You can, right now. What did we all think about True Gault? Tim: I liked her very much and I like the fact that she was trying to ... she was putting two things together. Her knowledge of fashion and her knowledge after checking that nine out of ten women have uncomfortable feet wearing high heels. Combination and trying to solve that problem which would be big time and the word will get out very fast I think. I'm totally behind her. Bill: I think she was great. I like that she named her company after herself and because then she's really committed. She's in there all the way. Jess: Sounds like someone I know. Bill: Yeah there is. Meet the Drapers, Draper Associates, Draper University. Tim: I'm not sure after we do this program we’ll feel the same way. Bill: But we’re committed, we’re in there and so is she and I like that. I don't know if the problem is as big as she says it is. Tim: I think we have check around. Bill: We’ll have to do some checks on go check with nine or ten women and find out how uncomfortable their shoes are. Jess: I think they’re pretty uncomfortable. Bill: Having a limited number of fashions is also going to be a little bit of a challenge because I know that women have such a huge pile of different options when they talk about their shoes. Jess: She said she had 20, 20 different designs that you iterate on. Technically they are 40. Joti Benson: She proved that her app works. If her app works for your feet it will work for everything else. Bill: I’m looking forward to seeing what kinds of shoe she sends me. This big boots. Jess: It’s funny. I wanted to let you guys all talk about I was curious what you all thought about this business but I have ... first of all as a founder, she was incredible. I thought she is going to make this thing happen but I have so many concerns. I see so many of these companies pretty regularly. I saw one last week that's doing the exact same thing and she has no media plan. She has no ... whether it be celebrity endorsements or some kind of seeding this online, you're competing with enormous brands these days in this space. Tim: Yeah but wait. Nobody I know. Do you know anybody that's trying to make them more comfortable? Bill: She was counting on a lot of word of mouth. Bill: That they could explain that this is how I do. Jess: -Tory Burch and all of these other incredible fashion brands? You're competing with enormous names. I do believe it's a multi-million, many multi-million billion dollar industry. I actually think it's bigger than whatever she said, but you have to be ...you have to have a major marketing plan. I thought she was incredible and I like the idea that you're going after ... it was unique that she's saying everyone's shoes are different sizes but I don't see anything game changing here that I haven't seen before. Bill: The virality of the shoes where I say those are nice shoes and you say, “Yeah I got them on True Gault,” that becomes a viral component. Jess: It becomes totally but not if you’re competing with like Kim Kardashian’s shoe brand. Jess: Not if you're competing with even like Chanel's shoes. She's at a price point that's probably somewhere Nordstrom, something like that. Unless ... I think she's also going to have to sell at major retailers in order to get it out in front of people. She hasn't even thought about. Joti Benson: She’ll have to partner with some major guns because she can bring her technology to the distribution channel of some gun and to maybe ... I like that she is ... she said she is talking to Nina Garcia and her joining the company right? Jess: That could be incredible. That might change everything. Jess: You don’t want high heels? Bill: I wear them very rarely but it'll be nice to have a pair. I'm not quite sure what I'll do with them. Jess: I think she’s a winner. As a human and a founder, she's a winner. Bill: Good. Now it's up to you, see what you think. Jess: What do you think? Jess: Do you want to vote? Vote, invest, up, down? Bill: No. They've already done that. Now we do the up/down thing. Tim: I'm going to give her an up. Are you up or down with that one? Jess: That’s not even a level. Bill: It’s a new level. Jess: You are up, down or sideways. Bill: I created a new level. In particular, the Company is dependent on Jennifer Tegan, Sandra Gault, and Julian Sanchez, who are Board of Directors, February 2014 to Present, CEO, February 2014 to Present, VP of Operations, February 2014 to Present, and CTO, November 2016 to Present of the Company. The Company has or intends to enter into employment agreements with Sandra Gault, Julian Sanchez, and Greg Kleine although there can be no assurance that it will do so or that they will continue to be employed by the Company for a particular period of time. The loss of Jennifer Tegan, Sandra Gault, Julian Sanchez, and Greg Kleine or any member of the board of directors or executive officer could harm the Company's business, financial condition, cash flow and results of operations. The Company is dependent on Jennifer Tegan, Sandra Gault, Julian Sanchez, and Greg Kleine in order to conduct its operations and execute its business plan, however, the Company has not purchased any insurance policies with respect to those individuals in the event of their death or disability. Therefore, in any of Jennifer Tegan, Sandra Gault, Julian Sanchez, and Greg Kleine die or become disabled, the Company will not receive any compensation to assist with such person's absence. The loss of such person could negatively affect the Company and its operations. The development and commercialization of our products and service is highly competitive. We face competition with respect to any products that we may seek to develop or commercialize in the future. Our competitors include major companies worldwide. Many of our competitors have significantly greater financial, technical and human resources than we have and superior expertise in research and development and marketing shoes, 3D imaging technology, and mobile apps and thus may be better equipped than us to develop and commercialize these products. These competitors also compete with us in recruiting and retaining qualified personnel and acquiring technologies. Smaller or early stage companies may also prove to be significant competitors, particularly through collaborative arrangements with large and established companies. Accordingly, our competitors may commercialize products more rapidly or effectively than we are able to, which would adversely affect our competitive position, the likelihood that our [products/services] will achieve initial market acceptance and our ability to generate meaningful additional revenues from our products. We rely on other companies to provide key product components such as leathers, padding, lasts insole boards, buckles, heels, packaging, and product information for our products. We depend on these suppliers and subcontractors to meet our contractual obligations to our customers and conduct our operations. Our ability to meet our obligations to our customers may be adversely affected if suppliers or subcontractors do not provide the agreed-upon supplies or perform the agreed-upon services in compliance with customer requirements and in a timely and cost-effective manner. Likewise, the quality of our products may be adversely impacted if companies to whom we delegate manufacture of major components or subsystems for our products, or from whom we acquire such items, do not provide key product components which meet required specifications and perform to our and our customers' expectations. Our suppliers may be less likely than us to be able to quickly recover from natural disasters and other events beyond their control and may be subject to additional risks such as financial problems that limit their ability to conduct their operations. The risk of these adverse effects may be greater in circumstances where we rely on only one or two subcontractors or suppliers for a particular key product components. In certain instances, we rely on single or limited service providers and outsourcing vendors from North and South America, Asia and Europe because the relationship is advantageous due to quality, price, or lack of alternative sources. If production or service was interrupted and we were not able to find alternate third-party providers, we could experience disruptions in manufacturing and operations including product shortages, higher freight costs and re-engineering costs. If outsourcing services are interrupted or not performed or the performance is poor, this could impact our ability to process, record and report transactions with our customers and other constituents. Such interruptions in the provision of supplies and/or services could result in our inability to meet customer demand, damage our reputation and customer relationships and adversely affect our business. We obtain these materials from a limited number of vendors, some of which do not have a long operating history or which may not be able to continue to supply the equipment and services we desire. Some of our hardware, software and operational support vendors represent our sole source of supply or have, either through contract or as a result of intellectual property rights, a position of some exclusivity. If demand exceeds these vendors' capacity or if these vendors experience operating or financial difficulties, or are otherwise unable to provide the equipment or services we need in a timely manner, at our specifications and at reasonable prices, our ability to provide some services might be materially adversely affected, or the need to procure or develop alternative sources of the affected materials or services might delay our ability to serve our customers. These events could materially and adversely affect our ability to retain and attract customers, and have a material negative impact on our operations, business, financial results and financial condition. Such intellectual property rights, however, may not be sufficiently broad or otherwise may not provide us a significant competitive advantage. In addition, the steps that we have taken to maintain and protect our intellectual property may not prevent it from being challenged, invalidated, circumvented or designed-around, particularly in countries where intellectual property rights are not highly developed or protected. In some circumstances, enforcement may not be available to us because an infringer has a dominant intellectual property position or for other business reasons, or countries may require compulsory licensing of our intellectual property. Our failure to obtain or maintain intellectual property rights that convey competitive advantage, adequately protect our intellectual property or detect or prevent circumvention or unauthorized use of such property, could adversely impact our competitive position and results of operations. We also rely on laws pertaining to trademarks and domain names to protect the value of our corporate brands and reputation. Despite our efforts to protect our proprietary rights, unauthorized parties may copy aspects of our services or technology, obtain and use information, marks, or technology that we regard as proprietary, or otherwise violate or infringe our intellectual property rights. In addition, it is possible that others could independently develop substantially equivalent intellectual property. If we do not effectively protect our intellectual property, or if others independently develop substantially equivalent intellectual property, our competitive position could be weakened. We also rely on nondisclosure and noncompetition agreements with employees, consultants and other parties to protect, in part, trade secrets and other proprietary rights. There can be no assurance that these agreements will adequately protect our trade secrets and other proprietary rights and will not be breached, that we will have adequate remedies for any breach, that others will not independently develop substantially equivalent proprietary information or that third parties will not otherwise gain access to our trade secrets or other proprietary rights. As we expand our business, protecting our intellectual property will become increasingly important. The protective steps we have taken may be inadequate to deter our competitors from using our proprietary information. In order to protect or enforce our intellectual property rights, we may be required to initiate litigation against third parties, such as infringement lawsuits. Also, these third parties may assert claims against us with or without provocation. These lawsuits could be expensive, take significant time and could divert management's attention from other business concerns. The law relating to the scope and validity of claims in the technology field in which we operate is still evolving and, consequently, intellectual property positions in our industry are generally uncertain. We cannot assure you that we will prevail in any of these potential suits or that the damages or other remedies awarded, if any, would be commercially valuable. We are subject to income taxes as well as non-income based taxes, such as payroll, sales, use, value-added, net worth, property and goods and services taxes, in both the U.S and Spain. Various federal and state labor laws govern our relationship with our employees and affect operating costs. These laws include minimum wage requirements, overtime pay, healthcare reform and the implementation of the Patient Protection and Affordable Care Act, unemployment tax rates, workers' compensation rates, citizenship requirements, union membership and sales taxes. A number of factors could adversely affect our operating results, including additional government-imposed increases in minimum wages, overtime pay, paid leaves of absence and mandated health benefits, mandated training for employees, increased tax reporting and tax payment, changing regulations from the National Labor Relations Board and increased employee litigation including claims relating to the Fair Labor Standards Act. Product safety and quality concerns, including concerns related to perceived quality of components, could negatively affect the Company's business. The Company's success depends in large part on its ability to maintain consumer confidence in the safety and quality of all its products. The Company has rigorous product safety and quality standards. However, if products taken to market are or become contaminated or adulterated, the Company may be required to conduct costly product recalls and may become subject to product liability claims and negative publicity, which would cause its business to suffer, and which could damage the reputation of the Company's products and may reduce demand for the Company's products. Consumer preferences our products change continually. Our success depends on our ability to predict, identify, and interpret the tastes and habits of consumers and to offer products that appeal to consumer preferences. If we do not offer products that appeal to consumers, our sales and market share will decrease. We must distinguish between short-term fads, mid-term trends, and long-term changes in consumer preferences. If we do not accurately predict which shifts in consumer preferences will be long-term, or if we fail to introduce new and improved products to satisfy those preferences, our sales could decline. [In addition, because of our varied customer base, we must offer an array of products that satisfy the broad spectrum of consumer preferences.] If we fail to expand our product offerings successfully across product categories, or if we do not rapidly develop products in faster growing and more profitable categories, demand for our products could decrease, which could materially and adversely affect our product sales, financial condition, and results of operations. In addition, achieving growth depends on our successful development, introduction, and marketing of innovative new products and line extensions. Successful innovation depends on our ability to correctly anticipate customer and consumer acceptance, to obtain, protect and maintain necessary intellectual property rights, and to avoid infringing the intellectual property rights of others and failure to do so could compromise our competitive position and adversely impact our business. We are vulnerable to fluctuations in the price and supply of raw materials, packaging materials, and freight. The prices of the raw materials, packaging materials and freight are subject to fluctuations in price attributable to, among other things, changes in supply and demand of leathers, shoe components such as Last, insole boards, outsoles, heels, packaging. The sales prices to our customers are a delivered price. Therefore, changes in our input costs could impact our gross margins. Our ability to pass along higher costs through price increases to our customers is dependent upon competitive conditions and pricing methodologies employed in the various markets in which we compete. To the extent competitors do not also increase their prices, customers and consumers may choose to purchase competing products or may shift purchases to lower-priced private label or other value offerings which may adversely affect our results of operations. We use significant quantities of leathers, fabric, and other components needed to make shoes such as but not limited to; insole boards, outsoles, heels, and buckles. We buy from a variety of producers and manufacturers, and alternate sources of supply are generally available. However, the supply and price are subject to market conditions and are influenced by other factors beyond our control. We do not have long-term contracts with many of our suppliers, and, as a result, they could increase prices or fail to deliver. The occurrence of any of the foregoing could increase our costs and disrupt our operations. A disruption in production at our manufacturing facility [or at our third-party manufacturing facilities] could have an adverse effect on our business. In addition, a disruption could occur at the facilities of our suppliers or distributors. The disruption could occur for many reasons, including fire, natural disasters, weather, water scarcity, manufacturing problems, disease, strikes, transportation or supply interruption, government regulation, cybersecurity attacks or terrorism. Alternative facilities with sufficient capacity or capabilities may not be available, may cost substantially more or may take a significant time to start production, each of which could negatively affect our business and results of operations. The potential impact of failing to deliver products on time could increase the cost of our products and harm our reputation. In most instances, we guarantee that we will deliver a product by a scheduled date. If we subsequently fail to deliver the product as scheduled, we may be held responsible for cost impacts and/or other damages resulting from any delay and ultimately harm our reputation as a result. To the extent that these failures to deliver occur, the total damages for which we could be liable could significantly increase the cost of the products; as such, we could experience reduced profits or, in some cases, a loss for that contract. Additionally, failure to deliver products on time could result in damage to customer relationships, the potential loss of customers, and reputational damage which could impair our ability to attract new customers. If we do not effectively assist our customers in using our mobile application, succeed in helping our customers quickly resolve mobile application user issues, and provide effective ongoing support, our ability to sell our products and services to new and existing customers would be adversely affected and our reputation with potential customers could be damaged. As a result, our failure to maintain high quality support services would have an adverse effect on our business and results of operations. In addition to the technologies we develop, our suppliers develop product innovations at our direction that are requested by our customers. Further, we rely heavily on our component suppliers, such as [name of suppliers], to provide us with leading-edge components that conform to required specifications or contractual arrangements on time and in accordance with a product roadmap. If we are not able to maintain or expand our relationships with our suppliers or continue to leverage their research and development capabilities to develop new technologies desired by our customers, our ability to deliver leading-edge products in a timely manner may be impaired and we could be required to incur additional research and development expenses. Also, disruption in our supply chain or the need to find alternative suppliers could impact the costs and/or timing associated with procuring necessary products, components and services. Similarly, suppliers have operating risks that could impact our business. These risks could create product time delays, inventory and invoicing problems, staging delays, and other operational difficulties. I like the concept and feels it is the future. I believe in this company and its founder, Sandra Gault! 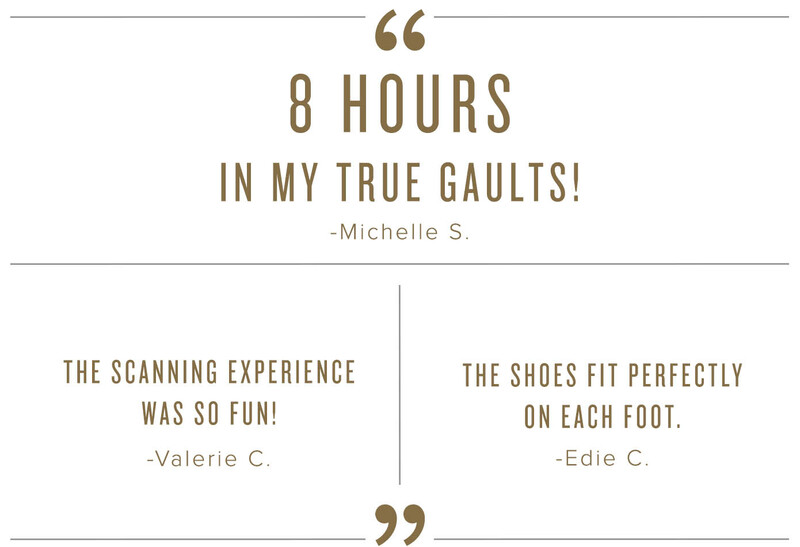 I have been a customer since day one and love all of my True Gault shoes. I wish great success for this company and its mission. The idea of having custom fitted and made, quality shoes was something that intrigued me greatly. I can't wait to order my 1st pair and the idea of also being a part of the same company was something I couldn't pass up. I think the concept will succeed. I believe in this product. I like that it is handmade and high quality. Feet are different and perfect fitted shoes are a great pleasure. Not only woman have different feet. Men too, like me and I wait for the day you make men's shoes.